I decided to give this little pet project of mine a bit of a facelift with a new look. It’s cute, dontcha think? Very girly, which isn’t really me, but it’s easy on the eyes. I don’t actually have much to tell you about right now so I thought I’d show off the planter at the front of my house. 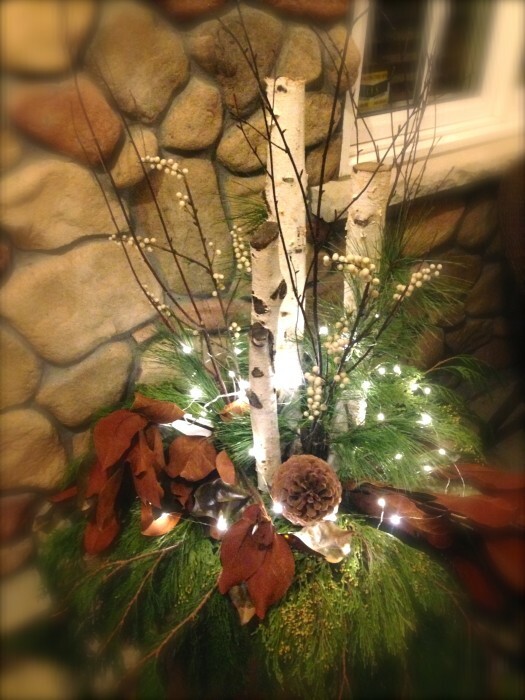 I’m proud to say that I’ve managed to use the same birch logs, some branches and the white berries in the arrangement for the last three or four years. I wish I could do the same with the evergreen boughs, but they just don’t last. Yes, very frugal of me. New this year are the little battery operated LEDs, which I love, but seem to be rather unreliable. But you must agree, they really do complete the look, don’t they? Happy Holidays to you all during this unseasonably warm winter evening!